WALTHAM - International jurist Richard Goldstone offered a spirited defense last night of his bitterly disputed United Nations report on Israel’s invasion of Gaza, reminding a Brandeis University audience that it was the first such UN report to accuse Palestinian fighters as well as Israeli forces of committing war crimes. But Goldstone faced an equally spirited rebuttal from former Israeli diplomat Dore Gold, who called the report “the most serious and vicious indictment of the state of Israel bearing the seal of the United Nations’’ since an infamous resolution equating Zionism with racism in 1975. Gold said the Goldstone report all but ignored Israel’s right to defend itself despite years of Palestinian rocket attacks and suicide bombings. 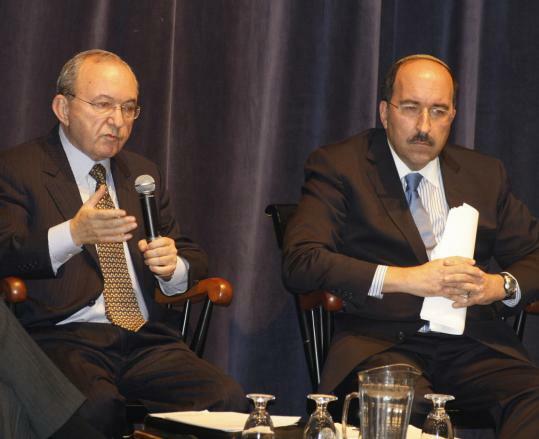 The Brandeis event marked the first time Goldstone has shared a forum with an Israeli since his four-member commission issued its report in September, to a storm of controversy. The Israeli government refused to cooperate with Goldstone’s team and has scorned the report as biased against Israel in its original mandate and prejudiced in its findings. Hundreds of students, faculty, and prominent members of Boston’s Jewish community packed a hall in the student center to hear Goldstone and Gold. Security was tight, with police from Waltham and neighboring Newton joining campus police. But the atmosphere stayed civil outside the hall amid rival leafleters, and inside the hall there were polite bursts of applause for each speaker. Several students with placards taped to their backs stood up in protest at one point during Gold’s remarks, but a mild rebuke from Brandeis professor and moderator Ilan Troen, head of the Schusterman Center for Israel Studies, prompted them to sit down. Goldstone said the forum allowed him a chance to explain the substance of his findings “and avoid the personal and ad hominem attacks that have marked the debate on the report to date.’’ Goldstone, a former South African constitutional court justice who is himself a Jew, said much of the criticism of the report was based on false premises. For example, he pointed out that many complaints say the UN Human Rights Council’s mandate to Goldstone was biased because it called only for an investigation of illegal Israeli acts. But Goldstone said he had refused to accept that mandate precisely because of its bias, and he had agreed to take part only when he was given the chance to rewrite the terms of the investigation. He said the revised language called for a probe into the conduct by both sides in the three-week war, which raged from late December last year to mid-January and took 13 Israeli lives and those of more than 1,300 Palestinians. Goldstone said his central criticism of Israel is that its strategy intentionally applied disproportionate force in Gaza to inflict widespread damage on the civilian population. His report found that the Israeli air and ground attacks destroyed 5,000 homes; put 200 factories out of operation, including the only flour factory in the country; systematically destroyed egg-producing chicken farms; and bombed sewage and water systems. “If that isn’t collective punishment, what is?’’ Goldstone asked. Gold - who has three degrees from Columbia University, including a doctorate, and now runs the Jerusalem Center for Public Affairs - answered that while the report did criticize Hamas, it concentrated more intensively on alleged Israeli wrongdoing, when it was Hamas units that hid among civilians and all but ensured they would end up in the crossfire. Goldstone said the days he spent in Gaza were full of surprises. He admitted to a bout of nerves at the thought of a Jew roaming around Gaza and said that just before he went he had a nightmare that he had been kidnapped by radicals “and that people in Israel were rejoicing,’’ drawing a laugh from the audience. But in the end, he said, he was struck by how similar Israelis and Palestinians were in their warmth and their aspirations. Goldstone has a long association with Brandeis and is board chairman of the International Center for Ethics, Justice and Public Life, which cosponsored the forum. Interest in the event was intense from the day it was announced last month, on the campus and beyond, and the forum was streamed live on the Internet. Earlier in the day, the UN General Assembly voted 114-18 to call on Israel and the Palestinians both to conduct credible investigations of the allegations in the Goldstone report.